This black and white photograph shows Lewis Taylor Hussey, (1866-1954). Hussey, a native of Ohio, came to Kansas at the age of two with his family and settled near the town of Williamsburg, Kansas. He later moved to Lyndon, Kansas, in 1889, where he established his professional career as an insurance adjuster. Actively involved in his community, Hussey organized the Osage Fire Insurance Company and he held a number of political offices from the city clerk of Lyndon to the deputy register of deeds of Osage County. He also served as Lyndon's mayor before making a political bid in 1904 for a seat in the Kansas House of Representatives. 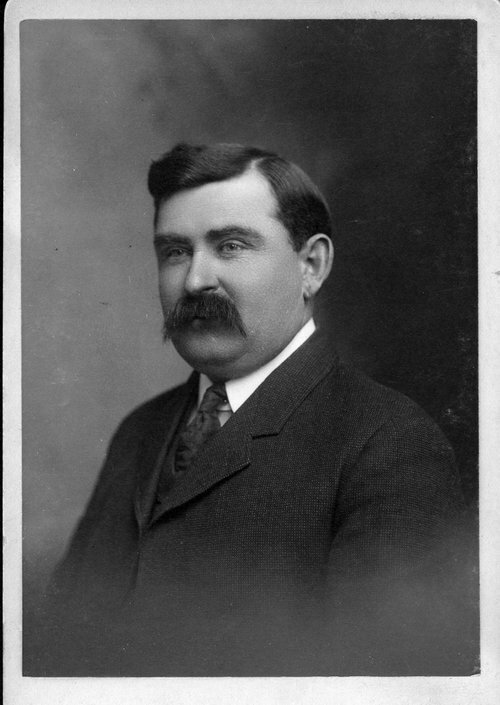 Hussey represented the Thirty-Fifth district for one term before his appointment in 1905 as the state's oil inspector. When he stepped down from the position in 1909, he continued to serve the state through a number of key political posts. In 1915, Governor Arthur Capper appointed Hussey to the position of state fire marshal. In 1923 he became the chairman of the Kansas Corporation Commission. Hussey's long and successful career as a public servant came to a close on December 29, 1954, when he passed away at the age of eighty-eight in Topeka, Kansas.